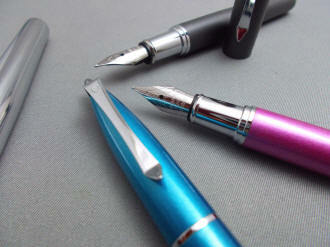 Monteverde introduces its most diminutive fountain pen -- the Poquito. If you're a fan of the Lanbitou Pocket Rocket and Space Arrow, here's another 'fit anywhere' fountain pen to add to your collection! 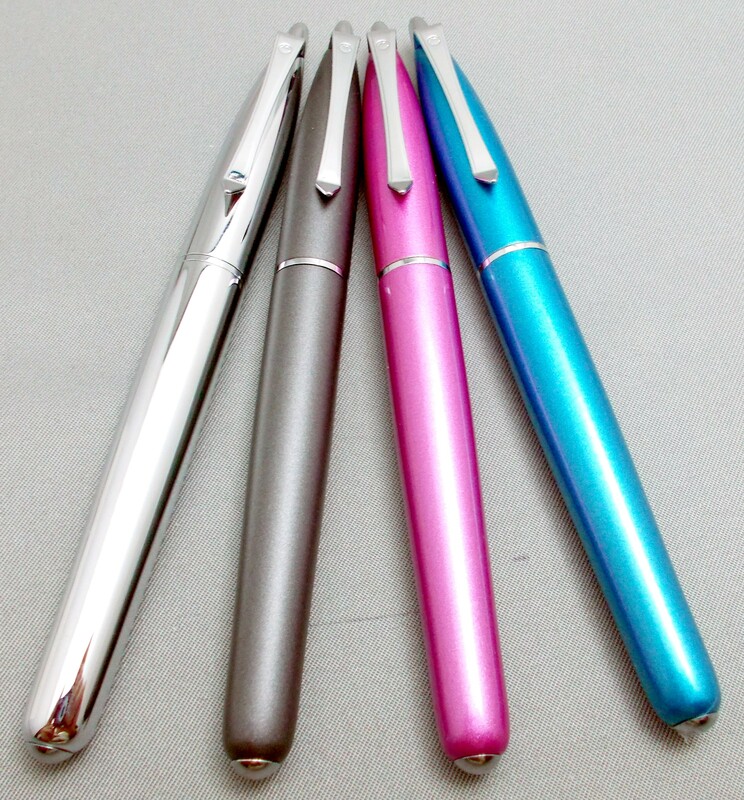 The pen measures 4-3/4" capped, 5" posted and 3-3/4" with cap held aside. 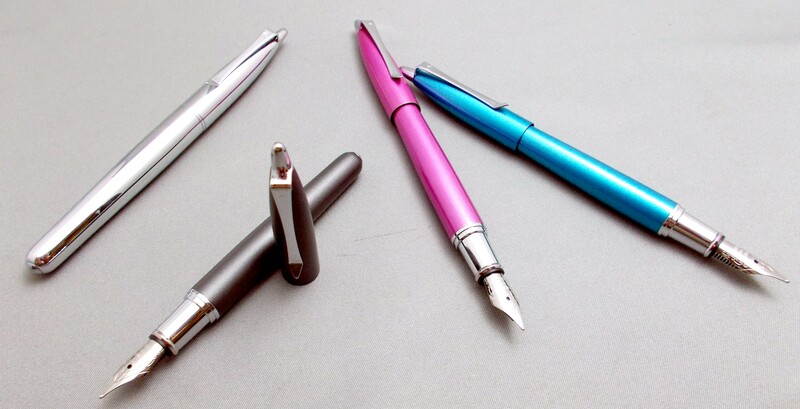 Of brass construction, with either a matte finish (in the case of the Stone Grey) or a metallic gloss lacquer for the other colors, this is one pen that won't weigh you down. 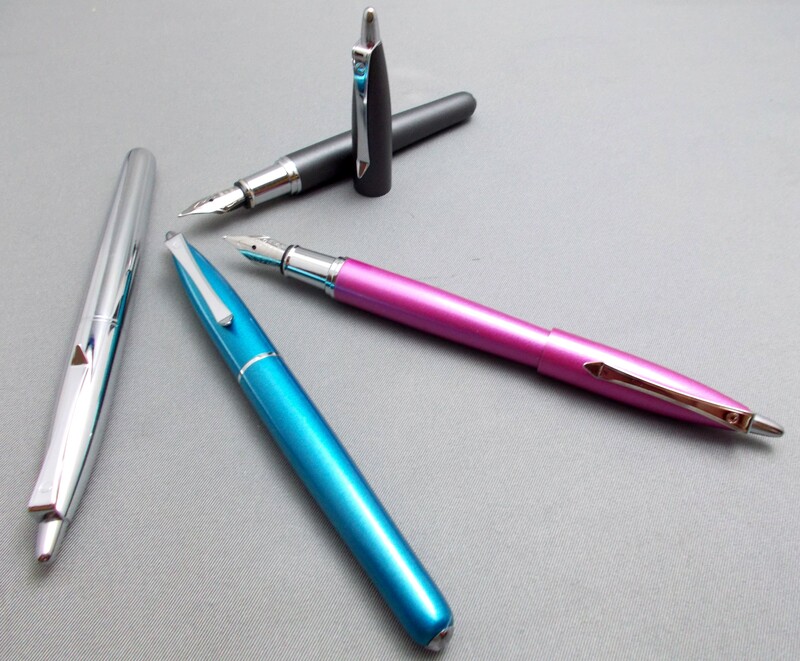 The fountain pen version carries over the design cues of the original Poquito ballpoint, in clip design and cap-top finial. 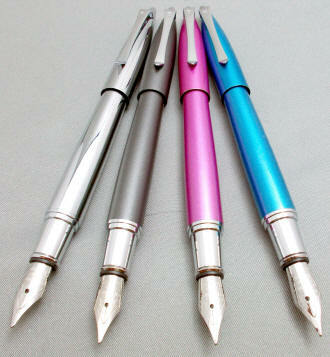 The barrel-end adds a chrome button and the clip sports a mini Monteverde mountain logo. Imprinted on the cap, opposite of the clip, is 'Monteverde' and 'Poquito'. Removing the slip cap, which 'clicks' back in place -- or friction-post to the barrel-end -- reveals the chrome section and nib. The nib is a one-size fits all affair, which I'd describe as a light-medium, meaning it falls between a typical western fine and medium. Unscrewing the all-metal threads between the section and barrel will not reveal a converter. The pen is designed for short international ink cartridges, such as those from Private Reserve. Not even the Monteverde mini-converter will fit. However, I've discovered that the Bantam mini-pump converter will, for those who still prefer to fill from a bottle. As with all new pens, I recommend to run a dilute solution of dishwashing soap (two or three drops to a small bowl of water) through a new pen a few times, followed by water only. Step one is effective at removing manufacturing oils that can tend to make the ink less than enthusiastic in heading from the converter/filler to the nib, and step two removes the traces of the detergent you've used...which tends to have the opposite, diuretic effect. The pen comes gift boxed with a starter cartridge in the barrel, along with Monteverde's warranty.